Mid-South Airways Incorporated, based in Statesboro, Georgia, was formed in 1959 as a way to connect small towns across central and south Georgia to larger cities and major airlines. Many of their destinations are certainly some of the smallest Georgia towns to ever have received air service. At the time, rail service was diminishing and the interstate expressways were not yet completed. Air travel over very short distances was seen by many as a feasible means of transportation. The airline was apparently short-lived. I have found no record of it after 1960. Timetable effective April 18, 1960 courtesy of Don Henchel. Cities served: Atlanta, Americus, Augusta, Columbus, Macon, Milledgeville, Savannah, Statesboro, Sandersville, Swainsboro, and Vidalia, Georgia. Here's a portion of the interior of Mid-South Airways flight schedule effective April 18, 1960. Courtesy of Don Henchel. 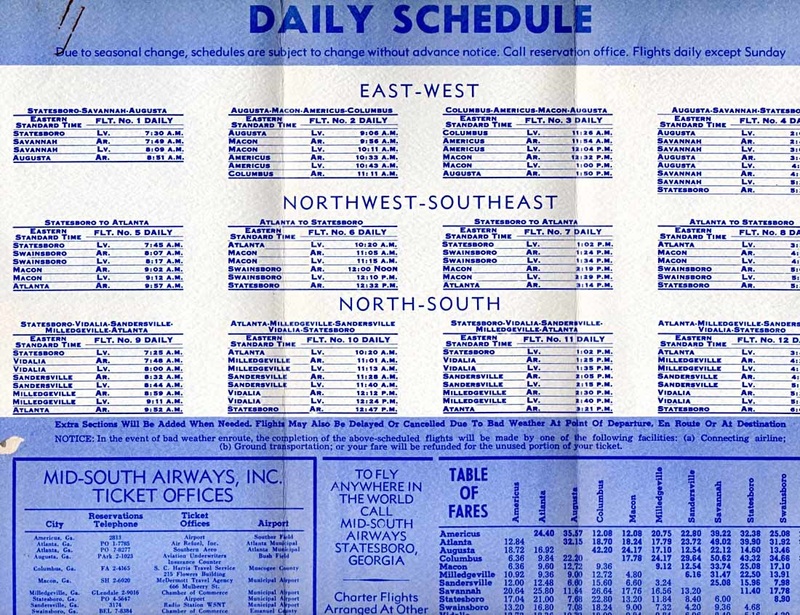 Mid-South Airways route map based on the April 18, 1960 timetable. Created with Great Circle Mapper.